ANTONIO REGUERO has been used to fighting for his place ever since he was a teenager in La Fabrica, Real Madrid’s youth system, when he rubbed shoulders with a youngster called Iker Casillas, a goalkeeper who went on to become a Spanish legend. So the news he has signed for Hibs, only to find himself again battling to become No.1, has left the 33-year-old totally unmoved, well aware that Mark Oxley will be head coach Alan Stubbs’ first-choice again. It’s a decision he accepts given the part Oxley played last season but, he warned, that won’t prevent him trying to wrestle the gloves from the big Yorkshireman. He said: “The manager has not said anything to me, but I know that Mark did very well last season. I came here to compete, enjoy my life and to fight for the number one jersey. After that, the manager will put one of us in. “Everyday I will fight for the number one jersey and after it’s the decision of the manager – it’s not a problem for me. Reguero met Oxley, nine years his junior, for the first time as he joined Stubbs’ squad at their pre-season training camp in La Manga and insisted he’s looking forward to a friendly rivalry with the former Hull City man who, having spent last season on loan in the Capital, recently signed a permanent two-year deal. He said: “People have in mind that two goalkeepers have to have a bad relationship. You work with your team-mates everyday and you have to spend so many hours with them and the goalkeeper coach. “In my career I’ve never had any problems. I think me and Mark will get on very well. It’s good to come away here, to live with your new team-mates, to train together, to have lunch together and get to know each other. “Competition makes you better and I’m sure for him it will be the same. I think it’s very good for any keeper to keep pushing you up. You have to do the best for yourself knowing you have a team-mate behind you trying to beat you. “At Real Madrid, Casillas was one year older than me and we trained for the whole year, all the goalkeepers, on a Wednesday, so I know him and other players that were at Madrid that are in the Premier League and La Liga. “It was when we were young, it was an education. I remember that time very well. We’ve not kept in touch. If we met in the street I’m sure we would have a chat, although Madrid is a very big place for that to happen. “For me, Madrid for me is the best club in the world. I met a lot of players and they’re playing at the top. It’s a shame because I’m better than Casillas and he is playing in the first team,” he added, smiling. After finding himself unable to make the breakthrough at Real, Reguero played for a host of clubs in the Spanish second tier, revealing that his days at the Bernabau ended, like those of many young players, simply because of the stiff competition and not, as has been claimed, a serious knee injury, something which has dogged him all his career. It was approaching his 30th birthday that Reguero decided to try his hand abroad, a shock signing for then Inverness Caley manager Terry Butcher. And that began a love affair with Scotland, Reguero going on to join Kilmarnock, where he found himself playing second fiddle to Craig Samson, before leaving without having played a game for the Rugby Park outfit to move on to Ross County. He played 16 times for the Staggies, vying with former Hibs goalkeeper Mark Brown for his place in the team, before becoming one of 14 players released by County boss Jim McIntyre at the end of the season. As such, he returned home to Madrid, believing the only time he might return to Scotland would be on holiday, until his agent called to say Hibs were interested in signing him for the coming season. He said: “I didn’t hesitate and after one or two days I signed. I’m happy, this will be my fourth year in Scotland and I know Hibs is a big club. Now Reguero and his girlfriend intend to set up home in the Capital. He said: “She will come to Edinburgh too and hopefully get a job. She is an architect. I used to live in Inverness and Glasgow. I always visited Edinburgh when my family came over because I think it’s a lovely place. I always hoped I could live there. “When I said goodbye to Scotland around a month ago, I was a little bit sad as everyone had treated me so well. I had a really good time. I’d not always played, but I really like Scotland. I met some good team-mates and even people outside the game. After I knew Hibs wanted me I was happy again. I’m going to live in Scotland again so I’m so happy. Reguero’s previous experiences in Scotland have, of course been with Premiership clubs, but, he insisted he had no second thoughts about joining a club in the second tier of the game, something he admits he never envisaged happening when Butcher made the switch from Inverness to Edinburgh. He said: “Terry did really well with Inverness. 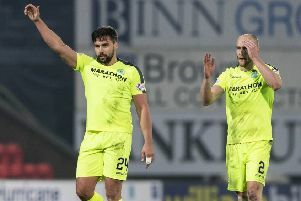 Hibs is a big club and he knew that, it was a big challenge, a big opportunity for him and it was a shame because almost everything was a disaster after that. It was a surprise, but that’s football. “Hibs were fighting with Hearts and Rangers last season and they impressed me. There sometimes seemed to be more coverage for the Championship than the Premiership and I saw them on TV. I knew the players and other players spoke to me about Hibs. “It’s a Championship club, but it’s a big club and the challenge is to go up. It was a shame for them last season, they played so well during the year..